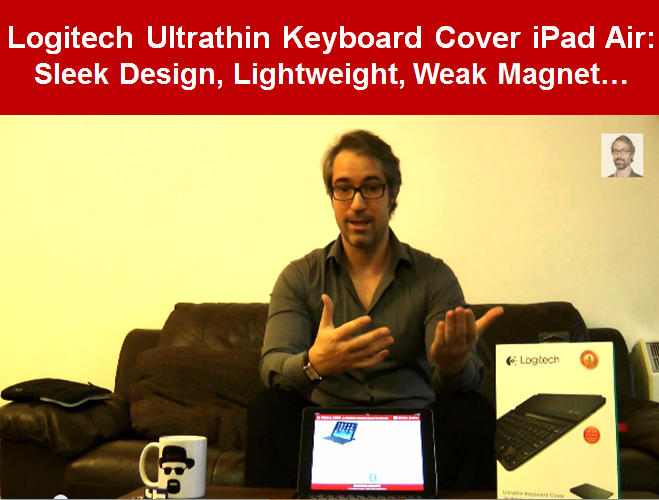 Logitech Ultrathin Keyboard Cover review. I’m looking to buy the best keyboard for iPad Air for content creators like myself: B2B, financial services professionals and bloggers. For those of you who are not familiar with my work on VisibleBanking.com, since early 2007 I’ve been curating and championing social media and digital innovation in the global financial services industry. You can find on my blog a broad range of content covering topics such as social media, social business and mobile, and formats like blog articles, photos, video comments and video interviews. In early November 2013, I bought an iPad Air. It proved an excellent purchase: it’s much lighter than before, it’s superbly designed and it’s fast and powerful. Arguably, it’s currently the ultimate hybrid device for both entertainment and work. Being both a global social media planner and a practitioner, I’ll let you imagine how much content I have to produce on daily basis. I need to be able to capture my ideas and articulate my concepts as and when needed throughout the day, from the office or on the road. In my opinion, the iPad’s on-board virtual keyboard is not fit for heavy typing and content production. I find it lagging a lot which makes it rather challenging to capture a conversation or cover a live event. I’ve been reading and watching dozens of online (video) reviews for the last month or so, but I couldn’t find the one which would provide me with all the information required to select the best keyboard for my needs. So I thought it’d be a great opportunity to test some of the best keyboards for iPad Air to date and share my feedback with you in the form of a social media mash up in the form of a blog post including content like PowerPoint slides, YouTube and Vine videos, and photos. Those are my very first product reviews, so not only am I feeling very humble and excited at the same time to share my work with you, it would also mean a lot to me to receive your comments and suggestions, and compare our experiences using those devices. In this review, I will share my thoughts and my hands-on experience of the LOGITECH Ultrathin Keyboard Cover for the iPad Air. As of Friday 20th December, this popular Bluetooth keyboard enjoyed a score of 2.0 stars on BestBuy.com (from only 5 customer reviews). You surely noticed the YouTube video at the top of my article, REVIEW Logitech Ultrathin Keyboard Cover iPad Air | Best Keyboard for iPad Air?. Watch my video to find out if this highly portable keyboard from LOGITECH met my expectations and fulfilled all my needs (business and entertainment). How Sleek is the Belkin Ultimate Keyboard Case for iPad Air? Is the ZAGGKeys Folio the Best Keyboard for Your iPad Air? I invite you to find below a photo selection of the Logitech Ultrathin Keyboard Cover. Those pictures are all included in my photo album, Best Keyboards for iPad Air, on Google+. 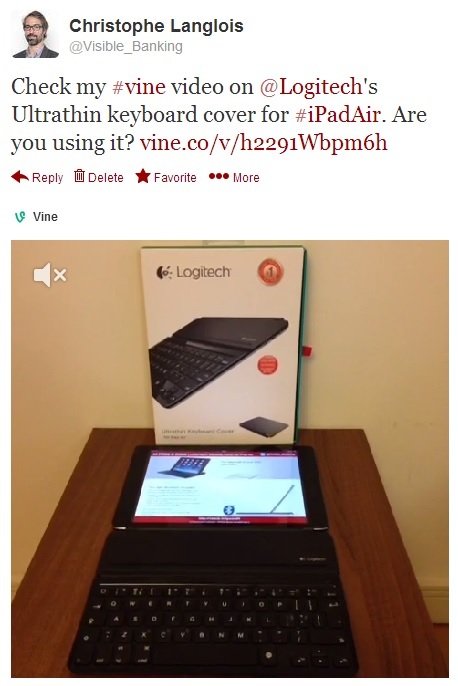 Please find below a screenshot of the vine video I put together to showcase the Logitech Ultrahin Keyboard Cover for iPad Air in just 6 seconds. Please find below a categorized list of strengths and weaknesses I shared on slideshare in my presentation, 22 PROS & CONS LOGITECH Ultrathin Keyboard Cover for iPad Air. I aimed to help you make a better informed purchasing decision by taking advantage of all the hours I spent researching for the best iPad Air companion to increase productivity on the go. So I’d hope you enjoyed my full review of the Logitech Ultrathin Keyboard Cover which could have easily be one of the best keyboards for the iPad Air, should the main magnet be as strong as on the previous model. Are you using this Bluetooth keyboard? Are you thinking of buying it? I invite you to share your questions and your comments on the Logitech Ultrathin Keyboard Cover for the iPad Air here on my blog, on Twitter, on YouTube or on Google+. How does this compare to that Belkin keyboard that you reviewed on the 20t? First and foremost the Logitech Ultrathin keyboard is a cover offering limited protection, and the Belkin Ultimate keyboard is a case. Considering that the main magnet of my Logitech cover did a poor job holding my iPad Air, I wouldn’t hesitate to go for the Belkin. I bought this over a year ago and it works as if I just unboxed it. It’s sturdy, protective, and works well as a stand or a keyboard. I really like the Logitech Ultrathin Keyboard Cover; it’s sturdy and securely holds my ipad. Also, “Ultrathin” is an incredibly accurate name for it, lol. The only drawback for me, is that it doesn’t provide back protection. Ditto, Augusto. I also like that the Logitech Ultrathin Keyboard Cover has a great battery life. I blog, I write, and I travel, so I’m always on my ipad. This keyboard makes it so much easier to do my work while I’m on the go. @Rhette, I noticed this about the Logitech Ultrathin Keyboard Cover. You should try using an aluminum Luvvitt Gorilla Skin to protect the back of your iPad. Thanks for sharing your experience. Unarguably the Logitech Ultrathin Keyboard Cover is the best, most portable keyboard for the iPad 2/3/4. Unfortunately, my unit let me down and the weak magnet made it a no-go for me. And I have to say that I got used to the multiple viewing angles offered on both the Belkin Ultimate Keyboard Case and the ZAGGKeys Folio. Thank you both for sharing your excellent experience with the Logitech Ultrathin Keyboard Cover for iPad. It’s a shame the newest version for the iPad Air doesn’t secure the iPad as well as before and doesn’t include even just a couple incremental innovations. Thanks for sharing your tips i.e. iPad Air protective skin compatible with the Logitech Ultrathin Keyboard Cover. I was thinking of a protective skin by http://www.bodyguardz.com/. This is a very thin, good keyboard but I think the Zagg folio is better. One thing I don’t like about it is that it does not protect the back of the iPad. I’ve had my iPad fall out easily though. I don’t like that. Thinking about returning it for this reason. I had Logitech Ultrathin Keyboard for iPad 3. I bought this one thinking there would have been some redesigned improvements and it would be as good or even better. I was disappointed. The iPad sits insecurely on the keyboard and the keyboard seems to be seaprating from the bottom portion of the material. I’m planning on returning mine. I’m afraid it’s just going to get worse and I’ll end up breaking my iPad. I think this iPad keyboard offers the best typing experience of all the keyboard cases I have had experience with. The Logitech Ultrathin Keyboard Cover is is less cramped than mostof the keyboards built into iPad cases that I’ve seen. I really like the keyboard on this one. I recently purchased the Logitech Ultrathin Keyboard Folio for my iPad Air. It’s a very lightweight which is a big plus in my book. The iPad slips nicely into the corners and it’s very easy to get it in and out. I also found the pairing to be fast and easy. I can’t really think of many downsides to this one. It really works for me.